​Vitamin E plays an important role in the body helping to prevent the oxidation of tissue which can lead to a number of health concerns. One such benefit is its positive effect on the oxidation of unsaturated fatty acids in cell membranes and the formation of peroxides. By working against this oxidation process, Vitamin E helps maintain a higher level of oxygen in red blood cells which is carried to the heart and other vital organs. 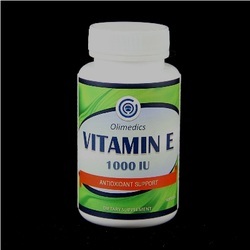 Vitamin E’s other benefits include bolstering the immune system and strengthening the circulatory system. CONTAINS SOY (SOY BEAN OIL).This product is manufactured and packaged in a facility which may also process milk, soy, wheat, egg, peanuts, tree nuts, fish and crustacean shellfish. KEEP OUT OF THE REACH OF CHILDREN. DO NOT USE IF SAFETY SEAL IS DAMAGED OR MISSING. STORE IN A COOL, DRY PLACE. Do not exceed recommended dose. Pregnant or nursing mothers, children under 18, and individuals with a known medical condition should consult a physician before using this or any dietary supplement. Other ingredients: Gelatin, vegetable glycerin, soy bean oil and purified water.